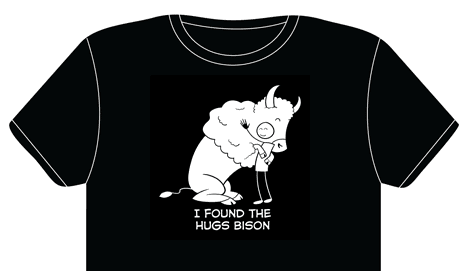 Hugs Bison shirts now available in the store! 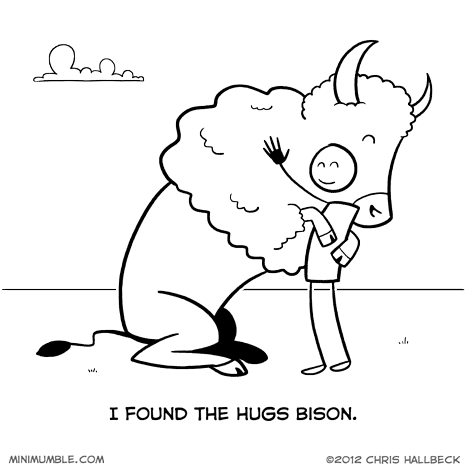 The hugs bison has been long rumored to exist. It is said that he can not be directly observed. You have to stand in the right place, stretch out your arms, close your eyes and hold your breath. The hugs bison doesn’t shower so he smells really bad. Hold your breath! The Higgs-Boson is a theoretical particle that the Large Hadron Collider was created in an attempt to verify. ZeoViolet: look up ‘higgs boson’ in google or something. I second this T-shirt request most adamantly. I’m sharing this with all my physics dork friends! Even my tribe wouldn’t eat such a friendly, comforting critter. That’s probably why they are so hard to find. I think this is probably my favorite of your comics so far, it has made me laugh each time I’ve seen it the past 3 days. Then I reached into his mouth and found the cud particle. Still making me laugh. My wife thinks I’m nuts. yaaay! print purchased!!! this continues to make me smile/less depressed and lonely every time i look at it ha. This one is just adorable. This is something I believe we could all benefit from more research towards. the hadron collider probably has the coolest name in all of science.